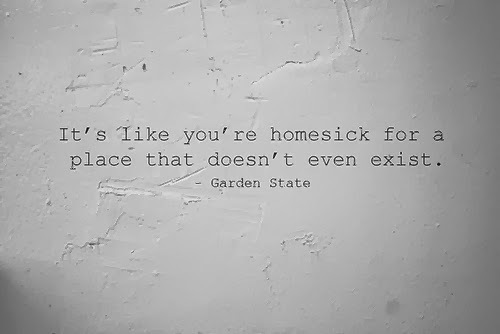 ... but I never miss home, what I miss is the past. I miss childhood. I miss those days which cannot possibly come back. But that doesn't stop me from wanting them back. I wish it was possible to go back to those relationships which were purely based on the fact that we shared the common classroom, and nothing else. Or where having common interests meant we were going to be best-friends-forever. Those days when everyone elder to me dotted upon me for absolutely no reason. So when I say, I am homesick, what I probably mean is that I am 'childhood-sick'. ... and in all honestly, I do not enjoy going back home any more. Everything has changed. Nothing is same. Noone is same. My grand parents are not there. Friends have moved on. Everyone is busy in their own lives. And when they are not busy, they wish to direct my life. In fact, I feel even more alienated when I am there among everyone than I feel when I am all alone here.
" ... and then among these intense thoughts in my head, the only thing I can count on is Dr. Fab's sense of humor. He would come home and make me laugh and would always be his jovial self *touchwood* ... and it would force me think, why the hell didn't God make me more easy-going and happy-go-lucky? ... "